Definition at line 141 of file mainframe.h. Reimplemented from ExtContextMenuHandlerT< ShellBrowserChildT< MainFrameBase > >. Definition at line 147 of file mainframe.h. Definition at line 1365 of file mainframe.cpp. References _last_split, _split_pos, and DEFAULT_SPLIT_POS. Definition at line 1555 of file mainframe.cpp. References _url, MainFrameBase::Command(), Create(), MainFrameBase::ExecuteCommandbar(), ID_VIEW_MDI, and IDW_COMMANDBAR. Definition at line 1375 of file mainframe.cpp. References ExplorerGlobals::_hframeClass, ExplorerGlobals::_hInstance, g_Globals, IDM_SDIFRAME, IDS_TITLE, and WINDOW_CREATOR. Referenced by Command(), and Create(). Definition at line 1401 of file mainframe.cpp. References Create(), MDIMainFrame::CreateChild(), GET_WINDOW, and HWND. Definition at line 1385 of file mainframe.cpp. References Create(), GET_WINDOW, HWND, and jump_to(). Definition at line 1692 of file mainframe.cpp. References _left_hwnd, ShellBrowserChildT< MainFrameBase >::_shellBrowser, COUNTOF, Entry::get_path(), Entry::get_shell_folder(), String::printf(), resize_children(), set_url(), and TEXT. Definition at line 1725 of file mainframe.cpp. References ShellPathInfo::_open_mode, ShellPathInfo::_shell_path, _shellpath_info, and update_shell_browser(). Definition at line 1739 of file mainframe.cpp. References ShellPathInfo::_open_mode, ShellPathInfo::_shell_path, ShellBrowserChildT< MainFrameBase >::_shellBrowser, _shellpath_info, OWM_PIDL, and update_shell_browser(). Definition at line 1624 of file mainframe.cpp. References _clnt_rect, _left_hwnd, _right_hwnd, _split_pos, and SPLIT_WIDTH. Definition at line 1574 of file mainframe.cpp. 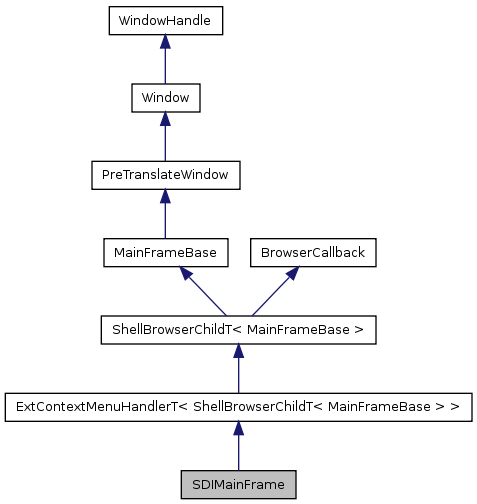 References _clnt_rect, MainFrameBase::_haddressedit, MainFrameBase::_hcommandedit, MainFrameBase::_hsidebar, MainFrameBase::_hstatusbar, MainFrameBase::_htoolbar, MainFrameBase::_hwndrebar, and resize_children(). Definition at line 1716 of file mainframe.cpp. Definition at line 1652 of file mainframe.cpp. References ExtContextMenuHandlerT< ShellBrowserChildT< MainFrameBase > >::_cm_ifs, ExplorerGlobals::_hInstance, WindowHandle::_hwnd, _left_hwnd, ShellPathInfo::_open_mode, _right_hwnd, ShellBrowserChildT< MainFrameBase >::_shellBrowser, _shellpath_info, _split_pos, DEFAULT_SPLIT_POS, g_Globals, IDC_FILETREE, OWM_EXPLORE, resize_frame(), SPLIT_WIDTH, and update_clnt_rect(). Definition at line 1417 of file mainframe.cpp. References WindowHandle::_hwnd, _last_split, _left_hwnd, _right_hwnd, ShellPathInfo::_root_shell_path, _shellpath_info, _split_pos, ShellPath::assign(), COLOR_SPLITBAR, CONTEXT, jump_to(), LOG, OWM_PIDL, OWM_ROOTED, PM_OPEN_WINDOW, resize_children(), resize_frame(), ScreenToClient(), SPLIT_WIDTH, TEXT, and ExtContextMenuHandlerT< ShellBrowserChildT< MainFrameBase > >::WndProc(). Definition at line 167 of file mainframe.h. Definition at line 166 of file mainframe.h. Definition at line 158 of file mainframe.h. Definition at line 159 of file mainframe.h. Definition at line 156 of file mainframe.h. Definition at line 169 of file mainframe.h.